With more than two decades of experience, we’ve seen a gamut of marketing efforts from a number of perspectives and budgets. Certainly the landscape of marketing has changed over the years, but one fundamental has not: the customer comes first. That’s what we were founded on. When you put a project in motion, it has your full attention and priority. Now, you have a firm that shares that perspective and listens to your whole story to ensure your marketing effort can enjoy full success. Colossians 3:23 says, “Whatever you do, work at it with all your heart… .” Faith is what gives me a drive for excellence. I’m not always perfect — OK, never perfect — but, that’s what constantly reminds me of the grace I need from a God that loves and pursues me. He gave His Son to die on a cross 2,000 years ago in my place and for the mistakes I’ve made. My life has been a journey discovering just how amazing our God is. But it wasn’t until I cracked open my Bible regularly and talked with God that I truly began to understand His character and heart rather than just what I heard in one hour on Sunday. What I found is a God who passionately pursues relationship with you and me. That’s pretty cool…and humbling. Remember that scene in Meet The Parents where Ben Stiller is outside the circle of trust? That’s us with God. Sin — the bad things we do — keeps us outside that circle. God is holy and without sin and with the sin and innately fallen nature of mankind, we’re separated. But, He made a way to get back into that circle and be right with Him. He sent His Son Jesus to die on the cross and take upon Him all our sin so that all you need to do is “…declare with your mouth, ‘Jesus is Lord,’ and believe in your heart that God raised Him from the dead, you will be saved (Romans 10:9).” At that point, you become a child of God and are adopted into a royal family. We don’t have to be perfect (if we were, we wouldn’t need Jesus as our Savior). It’s a gift that God gives to us when we have the posture of heart that asks Him to take the reins of our life. You become a child of God and you now have a Father that loves you unconditionally. He always has. 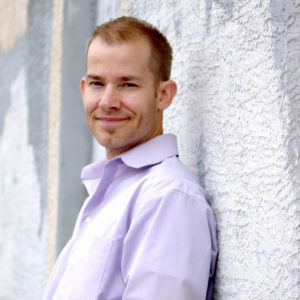 Rob Huff is president of ImageStudios based out of Franklin, TN. For more than 20 years, ImageStudios has been committed to helping companies find their true potential through marketing creative.